Iconic Victorian specialty outlet, Walker’s Doughnuts is venturing out of Melbourne and into New South Wales for the first time in its 13 year history. With an experienced multi-site franchisee taking on the area development rights for the state, the latest Walker’s Doughnuts outlet is set to open at Harbourside Shopping Centre in Darling Harbour in December 2018, with at least 15 other New South Wales stores planned for the future. The expansion announcement follows a successful run of development that has seen the brand grow from one store to seven, with a dramatic increase in store numbers over the last 12 months. Melbourne-based franchise consultancy firm, Franchise4U has been enlisted to oversee growth, with interstate expansion promising to triple the brand’s network over the next five years. “We are expecting rapid growth via franchising throughout Australia in the comings years” said Kevin Bugeja, managing director Franchise4U. While the collapse of brands such as Max Brenner and Donut Time have cast shadows over the profitability of the sweet and dessert sector, Bugeja likened the market to the booming burger industry, suggesting specialisation was a strategy for prolonged franchise success. “We are seeing similar trends to what we saw when the burger market heated up in the mid 2000s and there are now new market leaders in this segment like Grill’d & Retail Zoo’s Betty’s Burgers that have taken many of the mature and millennial burger customers away from the major fast food franchise chains, as the market leaders reshuffle,” Bugeja said. 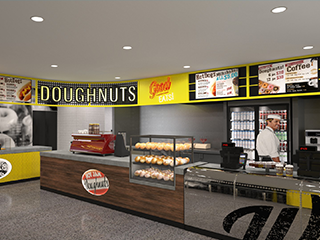 Bugeja said with the exit of market competitors, now is the perfect time for Walker’s Doughnuts to make the move interstate, suggesting the brand’s firmly established operational strategy allowed for greater franchisee profitability through low overheads and wage costs.